Michael Freado, seventh-grade world studies teacher at Dempsey, is the author of the event and said he likes to do one big project a year, and this year, he decided to put on The Campaign, an event where students portrayed historical figures and served as that individual’s public relations and guest service departments. Freado explained that teams had a historical figure serve as a candidate stumping for why they should be elected “Ultimate Historical Difference Maker.” Freado said the historical figures were all from the class’s unit on Western Europe’s renaissance and reformation between 1300-1600 CE. For The Campaign, each candidate had a PR person who posted on social media and tried to get their message out as well as a guest services team to create presentations and other ways to interact with potential voters. Freado said the event is about more than just history. Freado said the public relations teams posted on social media with the hashtag #Freado2018 so that everyone could easily find the tweets for the class. Seventh-grader Cassie Klumpp worked as a guest services team member for Francesco Petrarch, the 14th century scholar and poet who is often credited with initiating the Renaissance. Klumpp said that she designed the decorations for their section of the classroom which included leaves and Emojis. Klumpp explained that Petrarch was named poet laureate and was given a crown of leaves, and she added the Emojis represent the way that Petrarch encouraged communication and emotion after the Dark Ages. 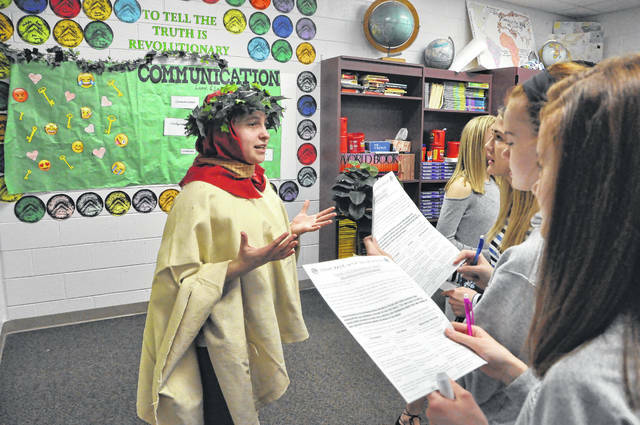 Petrarch himself, played by seventh-grader Natalie Hohman, said his platform was communication. “I’m all about communication,” Hohman said before explaining that more communication opens people’s minds to new thoughts and ideas. Hohman, wearing a crown of leaves during the event, said teams were given two weeks to work on the project, and she enjoyed learning about Petrarch and thought the project was fun. Freado said he hopes students take “a ton of history” away from the event, and he added The Campaign was aimed at “getting to peel back campaigns” as well as when advertisers and others will attempt to manipulate them. “I hope they get a sense of the world around them,” Freado said. Freado said the winner of The Campaign will be announced this week.